Broadgate Farm Cottages01482 888111work Self-cateringWINNER OF THE LOCAL REYTA AWARDS & YORKSHIRE WIDE WHITE ROSE AWARDS - BEST SELF CATERING 2018. A warm & friendly welcome awaits you at Broadgate Farm holiday cottages just two miles from the market town of Beverley and minutes from Beverley Westwood. 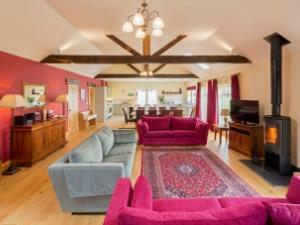 Our self catering holiday cottages are skilfully converted from period farm buildings from 2 to 6 bedrooms. Each cottage has its own private garden/patio area and the farmstead is set in 19 acres of grass & woodland. The cottages range from 2 to 6 bedrooms all finished to a high standard. The Forge, Stables, Foldyard, Courtyard and Cart House2 are 2 bedroom cottages, the Granary is a 3 bedroom cottage. The Barn House sleeps 8 in 4 bedrooms and the Cart House 9+3 in four bedrooms whilst High Barn sleeps 12+1 in 6 bedrooms. All cottages 5 star or 5 star Gold Award. Broadgate Farm is in the East Riding of Yorkshire where the Yorkshire Wolds meets Holderness. This county is full of hidden tourist gems, there is so much to do here that you could stay for a month and do something different every day! Broadgate Farm is ideally located with all of the local attractions within easy reach. Unlike many UK holiday destinations there is just as much to do here whatever the weather or time of year. We are less than a mile from our nearest village Walkington with its picturesque duck pond, three welcoming pubs and local shop. You can stay in characterful farm cottages and yet still stroll down for a meal or drink at the local hostelries. WINNER OF THE LOCAL REYTA AWARDS & YORKSHIRE WIDE WHITE ROSE AWARDS - BEST SELF CATERING 2018. We look forward to welcoming you to Broadgate Farm. Broadgate Farm Cottages offers weekly bookings starting on any day and sometimes short breaks. 5 Star Gold 2 bedroom cottage with a ground floor bedroom and wetroom, upstairs a master suite with king bedroom and full bathroom. See our website for full details, photos, floorplans and a virtual tour. The Stables offers weekly bookings starting on any day and sometimes short breaks. We are located between the town of Beverley (2 miles) and the village of Walkington (1 mile) in the East Riding of Yorkshire. By Train -Beverley is located on the Hull to Scarborough line. A train service from Hull to Beverley runs approximately every 25 minutes. Local rail operators include Arriva Trains Northern, Hull Trains and GNER. For train times visit www.nationalrail.co.uk or telephone 08457 48 49 50. By Bus - We are on a bus route into Beverley and regular bus services direct to Beverley run from Hull, York and Leeds. For timetable information please visit the East Yorkshire Motor Services website - www.eyms.co.uk. Our self-catering cottages are located on our farmstead situated just outside the village of Walkington in East Yorkshire. All our cottages have been converted from former farm buildings during from 2009- 2015 to current building regulations standards. Some of our cottages are more suitable than others for people with mobility disability. If you have any queries please do call on 01482 888111, a very detailed access statement is on our website or can be sent to you.